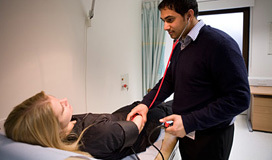 Programmes at The UCH Education Centre, London, are run in both clinical and behavioural training. Enhance skills through hands-on learning. 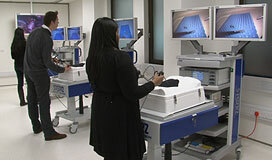 Training programmes at The UCH Education Centre are innovative, using invaluable learning techniques to complement the traditional 'book- or lecture-taught' format. Our activities provide engaging, hands-on experience coupled with indispensable DVD-based audio-visual feedback on performance. 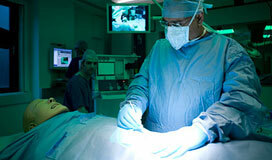 We run programmes frequently through two main channels, clinical and behavioural. These are inextricably linked, as we aim ultimately to build effective new skills and competencies into the overall delivery of superior clinical services. Click on the link for more information on our clinical programmes, which include a range of skills from basic cardiopulmonary resuscitation (CPR), recovery and routine ward tasks to advanced neonatal life support and minimal access surgery. Click on the link to learn more about our innovative behavioural programmes, where participants learn to tackle an 'assault course' of challenging behaviours encountered frequently in pressured environments. If you have a specific request for bespoke training, whether clinical and/or behavioural, we can develop your ideas into a range of tasks and effective teaching methods with specific outcomes. Please contact us to discuss rates, options and availability for The UCH Education Centre's innovative training programmes.